The SoxProspects.com scouting staff has been busy this week, churning out articles and scouting reports on almost 20 prospects. Director of Scouting Ian Cundall kicked things off with a Scouting Scratch on Aneury Tavarez, Danny Mars, and Cole Sturgeon, and Assistant Director of Scouting Chaz Fiorino followed that with his latest Write-Up focusing on former first-round pick Trey Ball (pictured). The scouting reports in the player pages were also updated for ten position prospects, headlined by CJ Chatham and Tyler Hill. The reports for five pitchers were updated, led by Roniel Raudes and Jake Cosart. As a reminder, be sure to keep track of the new Scouting Log to see when new reports on the players are available. Cundall gave more scouting updates in the most recent episode of the SoxProspects.com Podcast. He was joined by Editor-in-Chief Mike Andrews and Executive Editor Chris Hatfield as they discussed the new May rankings for the site. They went over who is rising and who is falling early on this season and also officially moved Rafael Devers into the top spot after the graduation of Andrew Benintendi. Devers has enjoyed his time at the top of the list, going 7 for 12 with three home runs and two walks so far in three games in May. As Eric Gendron noted in Wednesday's Cup of Coffee, Devers had a career-night on Tuesday, going 5 for 5 with two home runs. Tavarez has also been on fire, and he was promoted to Pawtucket on Monday. The 25-year-old outfielder hit .377/.473/.475 in 61 at-bats with Portland, and he is off to a quick 5-for-8 start with the PawSox with two home runs. Senior Staff Writer James Dunne wrote up the April Players of the Month, with Austin Rei and Shaun Anderson winning Player and Pitcher of the Month, respectively. It has been a long road back from Tommy John surgery for Brandon Workman, but the right-hander was called back up to Boston on Tuesday, almost two full years after undergoing surgery. 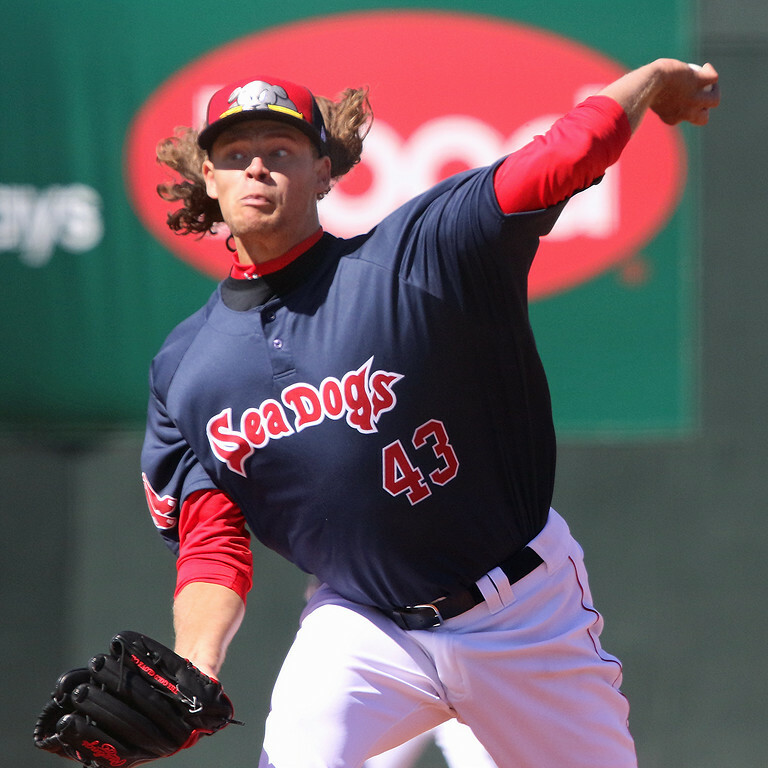 Workman did not allow a run in eight innings with the PawSox this year, striking out 11. The tough season for Blake Swihart continues, as the catcher went on the disabled list with a left finger contusion. In addition to Tavarez, Pawtucket also added Heiker Meneses from Portland, while Junior Lake, who played in 19 games for Pawtucket and hit .246, was released. To make up for the losses of Tavarez and Meneses, Portland added Deiner Lopez and Josh Tobias from Salem, while Salem added Nick Lovullo from Greenville and Trenton Kemp from extended spring training. Reliever Stephen Nogosek was named to MLBPipeline.com's Prospect Team of the Week after recording three saves in three appearances last week. He has seven saves on the year with a 2.77 ERA. Nogosek was also named the winner of the the inaugural BC Relief Pitcher of the Month Award for April, as he was honored as the best relief pitcher in the South Atlantic League. Few players have been hotter than Tzu-Wei Lin over the last two weeks, as he is batting .471 over his last 10 games with three home runs, two doubles, a triple, and three walks. With Steven Wright possibly facing knee surgery, the Red Sox will call up Kyle Kendrick from Triple-A to pitch against the Orioles on Thursday. Kendrick currently has an ERA of 6.00, as he has allowed seven home runs in only 27 innings this year. Kendrick may be getting passed on the depth chart by Brian Johnson, who went eight innings and allowed one run while striking out six, as documented in Gendron's Cup of Coffee from Wednesday. Johnson has impressive numbers across the board this season, and if Wright is out for an extended period of time, he may get the call to fill out the rotation until David Price is ready to return. Peter Abraham of the Boston Globe shared more good news on Kevin Steen, as the right-hander is now in stable condition in a Fort Myers, Fla., hospital after undergoing multiple surgeries on his legs. Abraham notes that no additional surgeries are planned.